You can add and delete time manually clicking on the Daily Timesheets page. Simply filter to the specific user and click the “Add Time” button as seen below. Next you need to add a time entry. After you click the “add time” button, a modal box will appear. This is where you will input your time entries or change the project time was tracked to. HH:mm, where “HH” is hours and “mm” is minutes. H(.d), where “H” is hours and “(.d)” is fraction of hours and it’s optional. Alternatively the separator could be “,”. Project, start time, end time and a reason are all required fields. You can also add notes about the work being performed. When done, simply click “save”. After you have added a time entry, it will immediately be reflected on the activities page. 1. Time added manually is recorded with 0% activity associated. 2. Notes will displayed there as well. You’ll be able to delete, edit and split a time entry at any time via the Daily timesheets page. To do this, you’ll just need to click on the Actions button next to a time span, and select the appropriate action from the dropdown list. 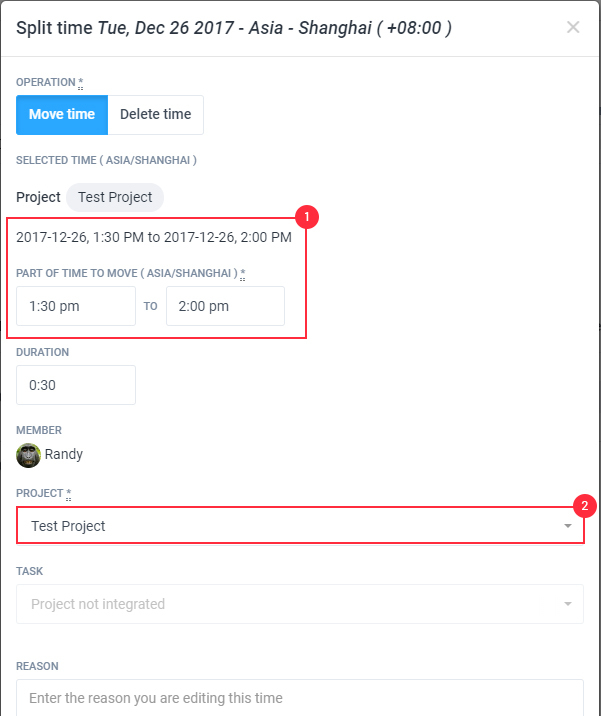 When splitting a time entry, select a portion of the time entry (start and stop time) that you want to split from the main time entry, then select the correct project. You can also click on either the Duration or Time span links in order edit the time. You’ll now have the ability to view your team’s work logs over the full weekly period under a single report, and add time to each day as necessary. To get started, you’ll just need to click on the timesheets section of the left sidebar, and select the Weekly option from the list that appear beneath it. 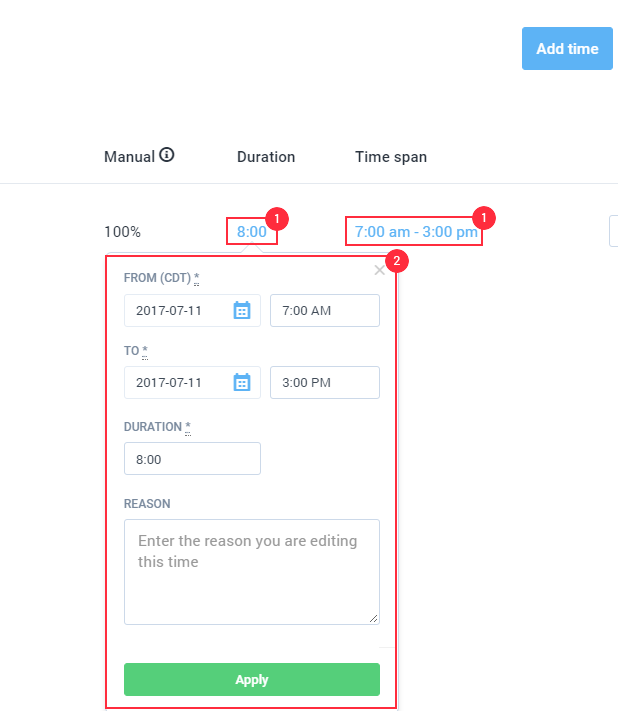 On the following page, you’ll be able to filter to the specific user, and then click the “Add Time” button to manually input the time and date, or click on the box under the specific day to add time directly to that date. You’ll receive a window to enter your timelog details identical to the one you’d receive when entering a timelog from the Daily Timesheets section. You’ll be able to add work notes there as well if needed. Editing, deleting and splitting time via the Weekly timesheets page is very simple! To do so, you’ll just need to click on the time under the specific day that you’d like to modify. A small window will expand from the time field which will list each individual sequence of time tracked that day. In order to make manual changes, you can click on the Edit, Delete or Split icons that are located next to the corresponding time span. 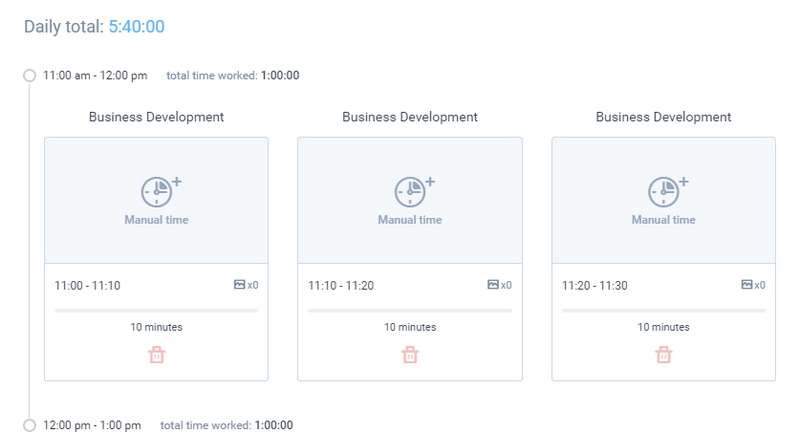 With our new Calendar timesheet, you’ll be able to scroll through and view your daily work over a week period, broken down into hourly increments. As with our other timesheet pages, you’ll also be able to Add, Modify time or add work notes from here! To do that, you’ll just need to click on the Timesheets section of the left sidebar, and select the Calendar option from the list that appear beneath it. Then, you can either click the “Add time button towards the top-right, or click the specific time frame you’d like to add your time to. You’ll then receive a window to enter your time log details identical to the one you’d receive when entering a timelog from the previous Timesheet sections. 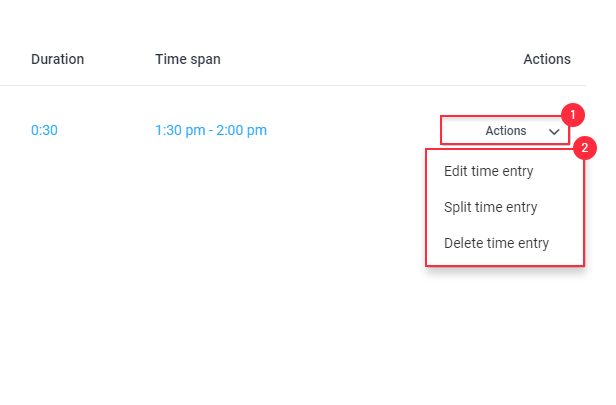 Similarly to the Weekly timesheets page, in order to delete, modify and split time entries on the Calendar timesheets, you’ll just need to click on that specific entry. A module will appear with the options to delete, modify and split time accordingly. You can edit which team members can add, edit and delete time entries manually. To do this, just filter to the specific organization, and click on “Settings” in the left sidebar. 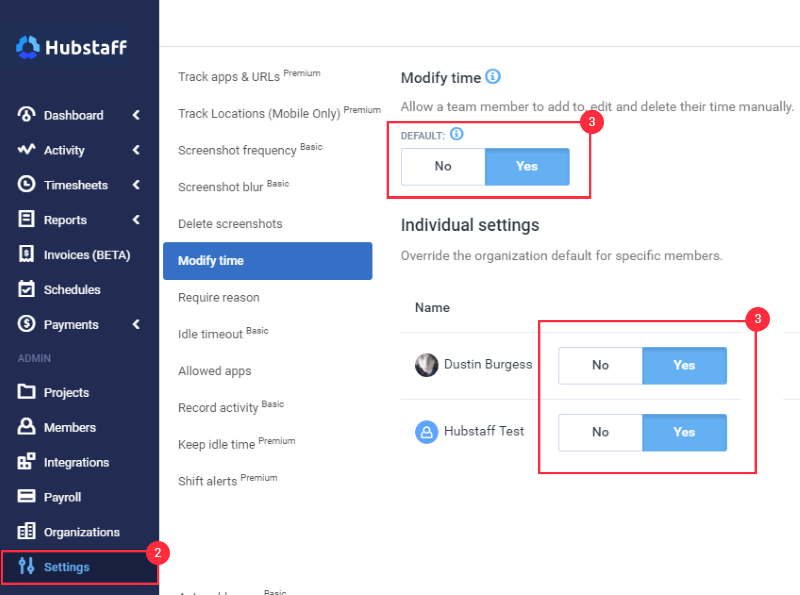 You’ll be brought directly to the Modify Time settings page, where you can change the organization default (effecting all users), or apply individual settings to specific users by clicking the option next to their name. Q: Will adding manual time overwrite time logs that currently exist. 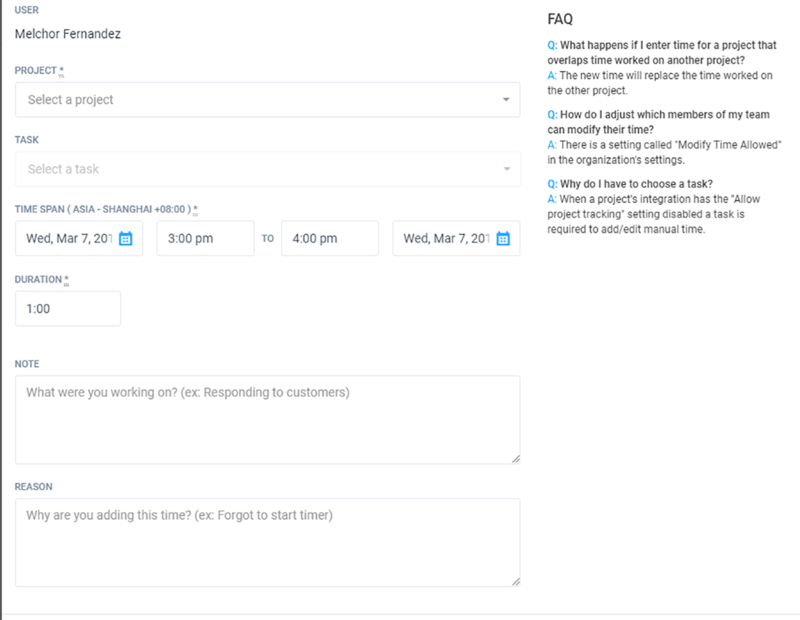 Q: Can I add time for two projects during the same timespan? A: No. Hubstaff will only allow you to work on one project during the same 10 minute interval. Adding time to a different project during the same timespan will overwrite the time on the original project. Q: Will manual time added show on the activities page and the reports page? A: Yes. Manual time logs will show up throughout the rest of Hubstaff, including on the reports page and the activities page. Q: Can I add or delete manual time for others? A: Yes. Organization owners/managers can add or delete time for others. Q: How do I adjust which members of my team can add manual time and which members cannot? A: There is a setting called “Modify Time” in the settings of your main organization. You can adjust these settings there. Q: Can I add or edit time in seconds increments? A. Yes, you can add/edit time down to the second. Q: Do I get notified when someone modifies their time manually? A. Yes, organization owners and managers will receive a report on their email the day after the manual time adjustments were done. Q: Can I add work notes when I add time manually? A. Yes, the ‘work note’ on the add time dialog is a convenience to quickly add a note without having to go to the activities page. If you need to edit a note you need to do that from the Activity page.